^ 3.0 3.1 3.2 3.3 3.4 3.5 Garanina, Svetlana. Sergei Mikhailovich Prokudin-Gorsky Biography (PDF). 2003. ^ 5.0 5.1 5.2 The chronology at Prokudin-Gorsky.org (accessed 26 September 2012) reports six weeks of study with Miethe in 1902. Other accounts give the year as 1889, but a primary source for that extremely early date is not apparent and it does not accord with the circa 1889 biographical details of either man. The major English-language source reporting 1889 (Adamson and Zinkham, p. 108) describes Miethe as "A brilliant young professor at the Charlottenburg Technische Hochschule..." and states (footnote, same page) that "While in Berlin, Prokudin-Gorskii is said to have given technical courses in photochemistry and spectrum analysis at the Technische Hochschule...", which evidences confusion of the facts somewhere along the line: biographies of Miethe all agree that he, not Prokudin-Gorsky, was the professor of photochemistry and spectroanalysis at the Königlich Technischen Hochschule (Royal Technical University) in Berlin, a post he accepted by invitation in 1899 after the sudden death (17 December 1898) of its previous longtime occupant, Hermann Wilhelm Vogel, the discoverer of dye sensitization and himself a color photography experimenter. It was apparently Miethe's first teaching position and the beginning of his involvement with color photography. Until then he had been employed by optical firms such as Voigtländer but was already a notable author, journal editor and inventor in the field of (black-and-white) photography. ^ Kington, Miles (2001-09-25). What's the Russian for: Say Cheese?. London: The Independent. 2001-09-25 [2010-05-23]. 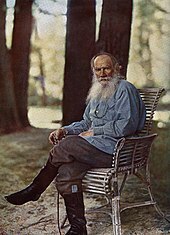 ^ Prokudin-Gorsky's Color Photographs of Tolstoy: in Tolstoy Studies Journal. University of Toronto. （原始内容存档于2005-02-06）. ^ Dikovitskaya, Margaret. 2007. Central Asia in Early Photographs: Russian Colonial Attitudes and Visual Culture (PDF). Slavic Eurasian Studies, no. 14: Empire, Islam, and Politics in Central Eurasia. Sapporo: Slavic Research Center. ^ Interview with Orlando Figes, presenter of a BBC documentary about Gorsky. BBC Four. ^ 12.0 12.1 Coe, Brian, Colour Photography: The First Hundred Years 1840-1940, Ash & Grant, 1978. Also published in the U.S., this excellent and amply-illustrated overview of the history of color photography before Kodachrome nevertheless, like other books on the subject, includes a few wrong dates and repeats entrenched but demonstrably erroneous conventional wisdom about the color sensitivity of pre-1906 photographic materials. ^ Blaise Agüera y Arcas. Reconstructing Prokudin-Gorskii's Color Photography in Software. September 28, 2004 [2012-03-22]. ^ [Prokudin-Gorsky.org DIGITAL CATALOGUE OF PROKUDIN-GORSKY'S COLLECTION] 请检查|url=值 (帮助). ^ Wilhelm Bermpohl. Professor Dr. Miethe's Dreifarben-Camera. ^ The Prokudin-Gorskii Photographic Record Recreated: The Empire That Was Russia - Ethnic Diversity. Library of Congress. [10 May 2013]. ^ Tipy Dagestana. Library of Congress. [10 May 2013].